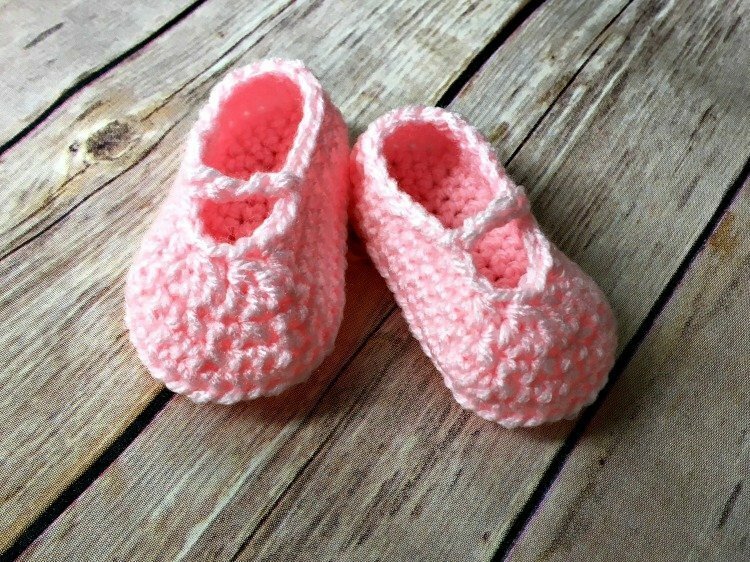 Baby Ballet Slippers - Free Crochet Pattern - love. life. yarn. 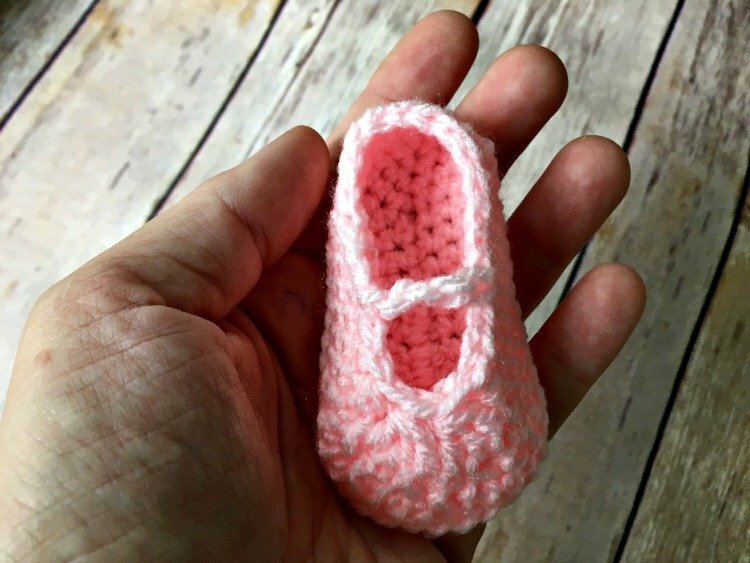 I guess this is my outlet for girly things since I am in a house of boys – but I won’t stop designing baby girl dresses, booties, and more! 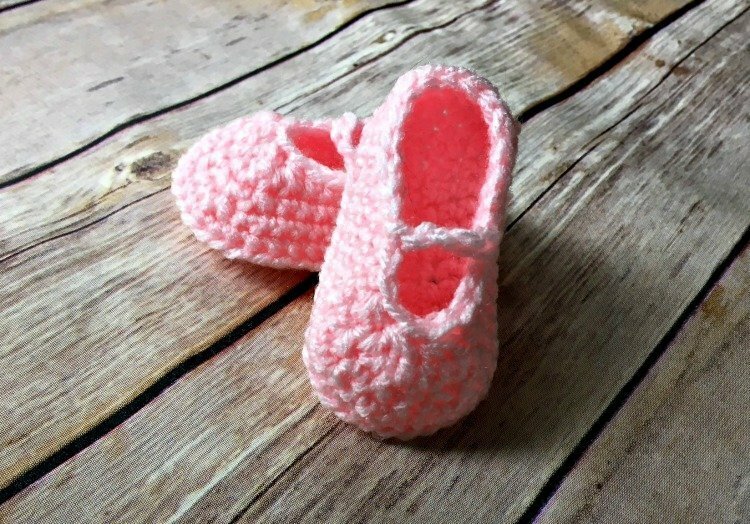 I do have some designs in the works for my boys, but for now I hope you enjoy this free crochet pattern. See my other baby patterns here. Round 1: 3 sc in 2nd ch from hook, sc 3 (4), hdc 2, dc 2 (3), 7 dc in last ch. Working on opposite side of ch, dc 2 (3), hdc 2, sc 3 (4) – 24 (28) sts. Round 2: Work 2 sc in each of next 3 sts, sc 8,(10) 2 sc in each of next 5 sts, sc 8 (10) – 32 (36) sts. Round 3: *Sc 1, 2 sc in next st; repeat from * two more times, sc 8 (10), repeat from * five times, sc 8 (10) – 40 (44) sts. Round 4: *Sc 2, 2 sc in next st; repeat from * two more times, sc to end – 43 (47) sts. Round 1: Sc in back loop only of each st around – 43 (47) sts. Round 2: Sc 21 (23), (sc 2, sc2tog) four times, sc 6 (8) – 39 (43) sts. Round 3: Sc 3, sc2tog, sc 4, sc2tog, sc 9 (11), (sc, sc2tog) four times, sc 7 (9) – 33 (37) sts. Round 4: Sc 2, sc2tog, sc 4, sc2tog, sc 8 (10), hdc2tog, (dc3tog) twice, hdc2tog, sc 5 (7) – 25 (29) sts. Make invisible join: Cut yarn and pull through center of last st made. (Do NOT fasten off the regular way). Insert hook from right to left in 2nd st to left and pull yarn through. Insert hook from right to left in the middle of the last st made (the one you pulled the yarn through initially) and pull yarn down through the middle of this stitch. 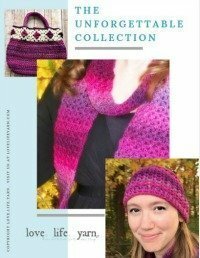 Join yarn in 3rd sc from hdc2tog. Ch 4. Join to opposite side with a slip st. Fasten off. *See photo above for help.